We all know a regular hectic morning, between getting ourselves ready for work, getting sluggish children out of bed, showering them is optional, a cursory brush of the hair, feeding them, throwing together their lunch and snack with a quick grab into the pantry to put pre-packaged convenience food into their lunchbox, and ,still out of breath, we run them to the bus stop. Phew. We don’t have time to think what price tag might be attached to that pre-packaged food at the other end. We are just happy to have made it again, another day of hectic working parents. We -at We Future Cycle- working in the classrooms and in the lunchroom teaching the children about the waste and where “away” is, see it every day. We see the plastic baggies, the pre packaged meat, cracker and sauce packages, the juice boxes, the juice pouches, the single serve apple sauce pouches. We see the huge amounts of packaging materials that come in, all in the name of convenience. As most of us don’t think past the curb where we bring our garbage can twice per week, there is no understanding what happens to the stuff once it leaves our house. It just conveniently “goes away”. Students in schools that are running the We Future Cycle Recycling program are learning that there is no “away”. Older students also learn about the cost of “away”. Schools are spending a large portion of their budget on waste management. Every dollar spent on Waste Management is a dollar NOT spent in the classroom. Parental convenience comes with a price tag to society. There is a much better way, that will save money on both ends and only requires a little bit of planning. Packaging a lunch from fresh ingredients in a reusable box, and sending watered down juice in a reusable bottle will solve two big problems in schools. It will reduce the waste management costs and it will feed the children healthier to allow for better learning. I am sure you will agree with me……our children are worth the little effort. Sitting on the carpet surrounded by a group of New Rochelle Barnard students and doing a presentation about recycling is one of my favorite activities. I just love helping students make a very important mental transition. When I show students a bunch of empty packaging material, one will invariably sneer at it and call it trash. Walking them through the fact that empty packaging is not trash, but rather material for new things is the most rewarding, because children get it so fast. They understand what it means to play with things over and over again, if you just put it in the right bin. At some point, I ask the students where they think “away” is, when they talk about throwing something away. I usually get a variety of answers ranging from “the garbage truck” all the way to “the dump”. Today, however, at Barnard Elementary School in New Rochelle, I was blown away as a 2nd grader very casually answered : “Garbage goes to the incinerator”. And that is exactly right. In a school, 95-98 % of the waste can be recycled, if it is just sorted out. The same applies to Westchester’s garbage of 48% organic, 33 % paper and 16% Commingled recycling. We have fabulous technology like an I-phone, but we cannot sort our garbage so that 95% can get recycled instead of getting burnt into our air? Well, New Rochelle Barnard Students have just joined the growing group of schools that say “Yes, we can make a difference, a huge difference” And that is exactly what they did. From 84 lbs of waste, only one single pound was trash, all the rest was sorted in the right bin and fed into compost, recycling or down the drain as liquid waste. I call that making a huge difference! New Rochelle Webster Elementary School is back! New Rochelle ‘s Daniel Webster Elementary School under the leadership of Melissa Passarelli and Greg Middleton has just moved back into their building. In August of 2015 roof problems necessitated for the whole school to be moved to another building. A mammoth undertaking. Moving back into the original building offered the opportunity to do a refresher student training and recycling program set up, so that students and staff can again be the leader among New Rochelle’s schools when it comes to sustainability. We Future Cycle staff members went from classroom to classroom and did grade level education with the students. Students learned where “away” is when one talks about throwing something away, and even kindergarten students understood very quickly, that “away” is not a nice place. Learning to identify materials and realizing that one just needs to put them in the right bin for them to be recycled was easily understood. Webster students all pledged to make a difference and they put that pledge to the test at the newly rolled out lunchroom recycling station. Three 5th grade students helped us to do a waste audit afterwards, and we had a wonderful helper at the station teaching her fellow students, especially the little ones. Thank you, Webster Students. From 163 lbs of sorted out waste only 4.5 lbs were actually trash. That is a 97% reduction. Truly wonderful. While this reduction is fabulous, a 4.5 lbs bag of trash containing exclusively single serve soft plastic wrappers or drink pouches is quite voluminous. Single serve packaging goes hand in hand with highly processed foods, not a good basis for a healthy diet to support good learning. Webster’s Principal Melissa Passarelli is getting ready to tackle this last piece to become a truly waste free facility. New Rochelle Columbus Elementary School celebrated its Red Carpet Affair on Thursday evening. Students walked on a red carpet, donned in their finest to the auditorium to see themselves on the big screen. Columbus Students were filmed as part of a documentary about how introduction of sustainability education can change a community. A film crew came in to capture the students doing a waste audit and filming the unbelievable amounts of waste generated in a school without recycling. And the film crew followed the students on their journey to learn to sort their waste in the lunchroom, all the way to the celebration to show case that Columbus reduced its garbage from 400 lbs to just 8 lbs, a 98% reduction, through diversion into recycling and composting. Students shared what they learned and how they will continue to make a difference. Just like at the Oscar’s the “actors” were interviewed to share their thoughts. Proud students were either the interviewer or the interviewee, asking questions about what the students have learned from the on-going recycling program in their lunchroom, how their parents made differences in their households, now that the students learned about recycling. The answers were heartfelt and sincere. Clearly, Columbus students know that their actions count and each and every one can make a difference. The lobby was filled with educational displays on how to make a waste free lunch and the PTA was offering reusable sandwich boxes, waterbottles, and shopping bags for sale. Principal Sonia Nunez welcomed everybody warmly to the auditorium, thanked especially the green students who are unwavering in their support of the lunchroom station and explained to the parents how this documentary came about. And then lights were dimmed and the show began. Mamaroneck’s Hommocks Middle School is the first public school in Westchester County to proudly operate a Rocket composter. Seventy-seven pounds of food waste are gobbled up daily and through the We Future Cycle sorting program, and Hommocks is now diverting 86% of its waste into composting or recycling streams. This is what 254 lbs of lunchroom waste look like, and — believe it or not—- only 3 lbs of it, was actually trash. Everything else is being fed into food waste composting and recycling. 72 lbs went as left over liquid down the drain, and the students sorted 15.5 lbs of untouched food out to donate to the local soup kitchen. That is a whopping 98.8% reduction. Seriously …. way to go. Jefferson Elementary School under the leadership of Kim Nieves and LeAnn Bruno has always been on New Rochelle’s forefront to bring sustainability to their students. 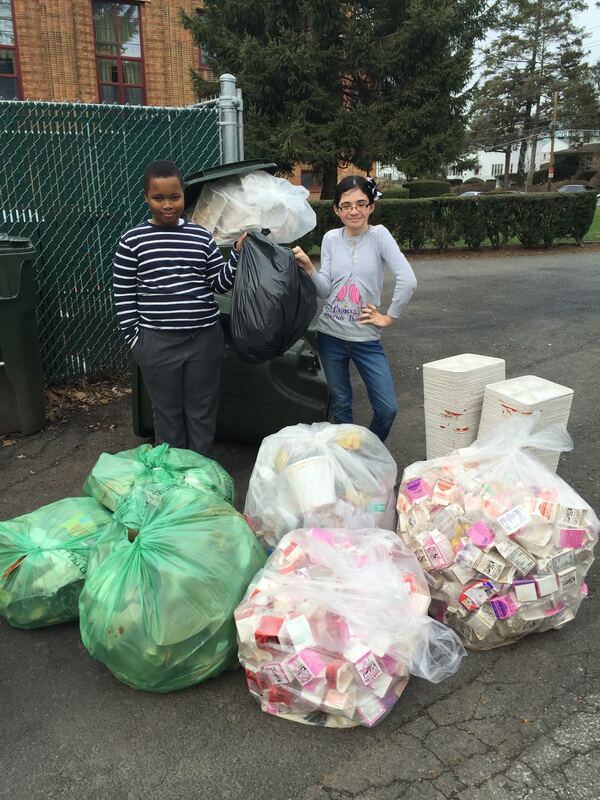 Already in 2011, when the We Future Cycle Recycling program was in its infancy and New Rochelle was still serving its students on Styrofoam trays, Ms Nieves and Ms Bruno knew that making the students partners and teaching them to care and sort is a life long skill. Fortunately, after a 5 year battle, Styrofoam is permanently off the menu in New Rochelle and We Future Cycle gives full credit for this to Jeff White, Assistant Superintendent of Business. Mr White, being new to the district, saw immediately the incredible social, educational and environmental value that the program offers to the children and understood that serving our young ones on a material that contains Styrene, a chemical that has recently been classified as “reasonably anticipated human carcinogen” was inappropriate, no matter how much less expensive it might be. Jefferson adjusted its program to follow We Future Cycle’s guidelines, so all New Rochelle schools are set up exactly the same. We Future Cycle is enjoying working with Jefferson’s enthusiastic recyclers. There is nothing as rewarding as having a kindergarten student hug your leg and say thank you for teaching her to recycle.